We’d love your help. Let us know what’s wrong with this preview of Bloodline Maharlika by Anne Plaza. There's nothing ordinary about Owenn Magpantay the moment awareness seeped through her consciousness. A demi-goddess born from the line of maharlika and Bathala himself, Owenn is the hope for peace between mortal and the divine. But when the god Apolaki decried Bathala's love for humans, Owenn became his ultimate target. Together with her half-sister, the bathaluman Mayari There's nothing ordinary about Owenn Magpantay the moment awareness seeped through her consciousness. 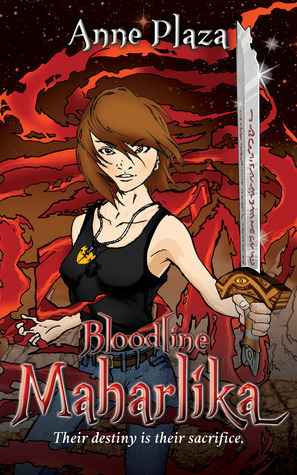 To ask other readers questions about Bloodline Maharlika, please sign up. To me, the main character Owenn comes off as annoying. I find it great that she has this tough demeanor and yet full of insecurities due to her mission. That being said, I think that it could have been fleshed out more. As the main character, I wanted to root for her, but the end result is that I didn't care about her at all. It's always a delight reading Philippine fantasy/spec fic. I really liked this first installment. I am eagerly looking forward to their next adventures.